I’ve always found it strange that parents aren’t more concerned about their children’s eyesight. The important point to consider is that the longer you wait to test your child’s sight, the greater chance there is for permanent loss of sight, or a decrease in quality of your child’s vision. We all love how cute kids are, so why don’t we show them we care by ensuring their vision is at its optimum? Kids don’t tell you they cannot see well. They don’t often say, ‘My eyes are blurry.’ What they do say are statements like, ‘I don’t like reading.’ Sometimes you need to read between the lines to figure out your child is having problems with their sight. 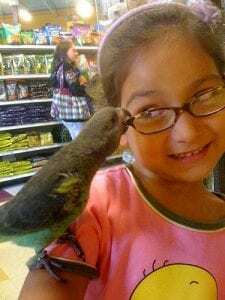 I’ve been witness to many adults who don’t want to spend much money on their kid’s eyesight when compared to their own. Why? After discussion with my patients I think it’s because they believe the kid’s glasses will be easily broken during play. 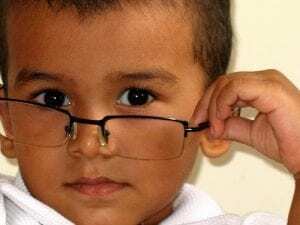 But how do lower cost glasses affect children’s lives? First of all, lower cost glasses only come in limited ranges, so they may not be the best visual solution for your child. 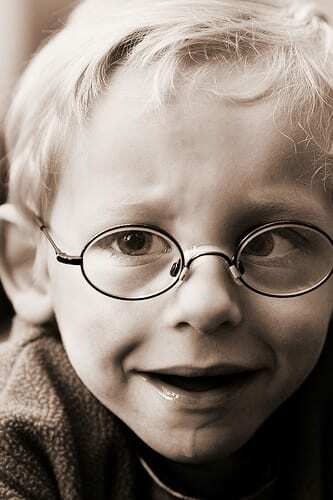 Secondly, if the glasses are unfashionable, they can affect how his or her peers treat them at school. Children are impressionable, and you can give yours added confidence by showing them that you care. The bottom line is, you fix a child’s eyesight because you realise it’s very important to their performance now, and because you have a caring long-term vision for their future. 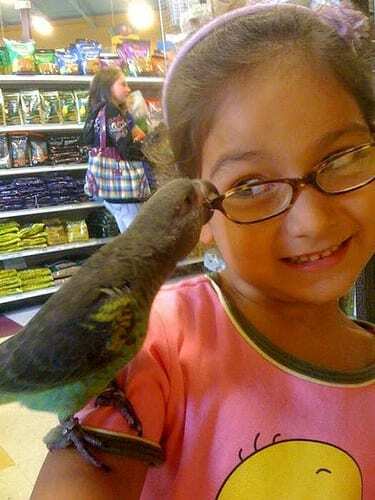 This girl’s glasses are so cool a parrot tried to steal them! Distance from TV: When they watch television, the child should be 4 metres (at least 3 metres) away from the TV screen, no matter how big the screen is. Lighting when watching TV: Do not darken the room like a cinema. If you only have one light on, place it between the child and the TV. The second best lighting position is above the TV. Try not to have the light situated right above the child, as this creates more glare on their eyes. Outdoors play: This is very important, but it too must be done in moderation. If the child has to be inside, then they should spend time playing games etc. that are not done while sitting in front of a computer. Lighting for other activities: Use coated Pearl light bulbs, and tell your kids not to look directly into a light source, as their eyes will become uncomfortable from the glare. Direct light like this causes the pupil size to shrink in order to reduce the glare. The eye muscles then have to strain, which can often induce pseudo myopia. Diffused light is best. For example, have the light shining towards the object that the child is looking at, not at the child. When reading books: Always keep the book at least 40cm from the child’s eyes. We tell children if their fist is sitting under their chin in the ‘armrest’ position, the book should be as far away from their eyes as their elbow is. Time/duration: It is recommended to not spend 2, and no more than 3 hours at a time looking at one specific location. If it’s not a movie they’re watching, have them take a 10-minute break every half an hour. Time when reading: Every 30 minutes the child should look into the distance for 10 minutes (at least 5 minutes! ), looking out a window etc. Activities: Outdoors are best because of the natural light. The child should spend time doing things that involve both slow and fast eye movements – activities involving hand–eye coordination like ball games are excellent for this. Indoor activities: Everything is great except for computers. Lego, board games etc. are all good. Even with dribble on his chin, this little guy looks cool. We at Visual Q Eyecare know that parents love their children. Sight is one of the most important senses human beings use in their lives. Invest in your child’s future by bringing them to see us for an eye test (Call us on 9866-3880), and if corrections are needed, we’ll make sure your kids get the best vision solution possible. Thanks to Raksh1tha, courosa, Liz Henry and schani for the images via Creative Commons.